Don’t let me scare you away by using the word painting. This is the EASIEST painting you’ll ever do, it will leave you feeling like a pro! 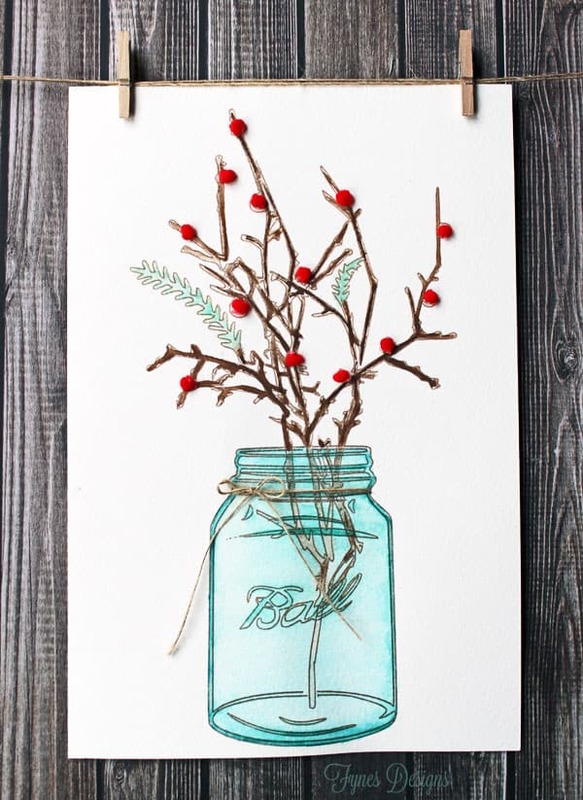 The silhouette sketch pens are the secret to this ultra easy Holiday Mason jar watercolour painting. If you haven’t used the silhouette sketch pens with your cameo your totally missing out on a fabulous feature! With the help of May Arts Ribbon and Scrapbook Adhesives this plain ol’ drawing can become a work of rustic art! 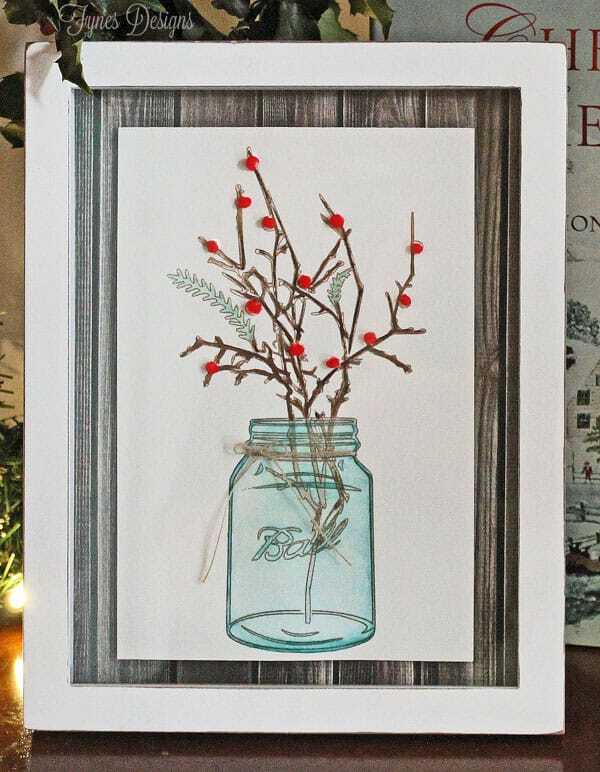 Use your Silhouette plus your silhouette sketch pens to create the mason jar drawing (provided below), on a small piece of watercolour paper (you can get inexpensive pieces at Michaels). 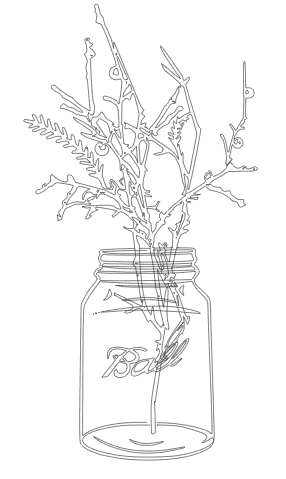 Check out this Mason Jar sketch tutorial for some great tips. Gather your supplies- watercolour paint in blue, green, and brown (quality doesn’t matter, just Crayola is fine), May Arts burlap twine, and red pom-pom ribbon, and Scrapbook Adhesive dotz, two paintbrushes, and a needle. I have no painting skills so my technique is probably very poor, but you can refer to this “How to Approach Watercolour” if you’d like some actual tips. I used one brush to paint the jar with water, and then slowly added blue with the other, brushing more water over areas that I wanted lighter. Then I used a fine tip brush to fill the branches in with brown. Cut pom-poms from the May Arts ribbon and attach the berries using Scrapbook Adhesive dotz. Use a needle to poke a hole on either side of the rim of the Mason. Thread the burlap string through and tie in a bow. Add your watercolour painting to a frame, and you have yourself a beautiful piece of Holiday Art, perfect for a gift or to spruce up your home! Please enjoy this Silhouette sketch pen drawing I created. Virginia!! This is AWESOME! I love it!! Your watercoloring is perfect and the pom pom accents are adorable. I can’t wait to get my Cameo, hopefully, this week. I’m going to save this image. Thank you! You’ll LOVEEEE your cameo, such a game changer in crafting life. Have fun with it! Stunning card and just perfert for a special Christmas card. Love the pom poms. Beautiful–love the blue mason jar. Love how this turned out, and the addition of the pompoms is so fun! Wow, this mason jar art is really awesome. This is absolutely gorgeous! LOVE how it came out! TFS! Very nice… I like it so much!!! Would be nice at my place! I just bought the pens but haven’t tried them out yet. thanks for the tutorial and directions on making this beautiful drawing. Love the poms as embellishment. This is sooooo lovely! This would make a lovely framed gift! Not only do you have a tutorial, but you shared the image with us! Thank you so very much! This is so amazingly COOL! Great outside-of-the-box project! This painting turned out so pretty! I love the Holly, thanks for sharing. This turned out so pretty! Your tutorial is great! Lovely work of art. I don’t have a silhouette cameo so I would love to know how to reproduce it the old fashioned way. The colors are so pretty. Hi Judy, I don’t see why you couldn’t just print out the image. I’ve never tried feeding watercolor paper through a printer but some thin ones are available, so I don’t see why it wouldn’t work?! Let me know if you give it a try! Love this. Very creative idea. Great project, your painting is beautifully done. 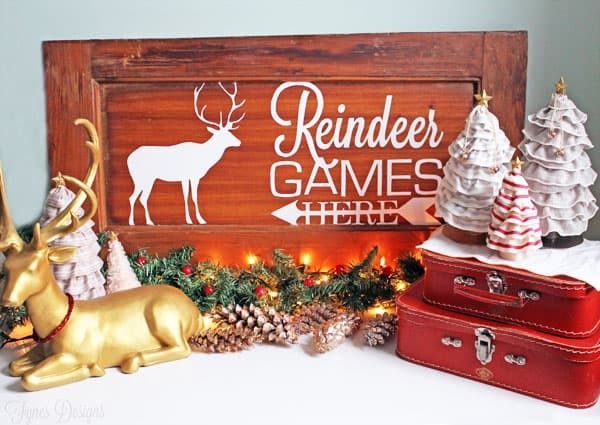 Love how you made it a home décor project and placed it in a frame. Very creative. I want to try those pens….have to make a craft stop this weekend. Very beautiful. I never would have thought of that combination, but it really looks great! I am in love with this! Thank you for the great tutorial! I am going to give this the old college try! TFS! Very pretty card. Those berries look wonderful. Amazing!!! You are so talented!!! the jar is the perfect color! Hi. I love this. It is gorgeous and too perfect – I love watercolours! Pinning! Stunning, Virginia- pinning for sure!! I love the color and the way the pompons bring it right out of the page! Great 3d effect with the ribbon– I’ve been drawn to mason jar project ideas of late. Very nice. This is gorgeous!! I’ll be trying this out whenever I get my hands on some sketch pens. Thank you for the free file! Pinning!! Thanks for the shout-out to my Mason Jar Sketch Pen creation! Yours is uh-ma-zing…I love the added details of the berries and burlap string. I’m TOTALLY going to feature you in my Reader Showcase next week (if that’s cool with you). Happy holidays! That would be great Lauren! Great tutorial!! this is absolutely gorgeous! I def want to try this after the holidays! Beautiful Painting! I’m crazy about anything mason jar! Thanks so much for sharing! This is lovely and so easy, I will try something like this with my kids 🙂 They will love that.